This is a clearance deal. Only 10 in stock. First Come, First Served. 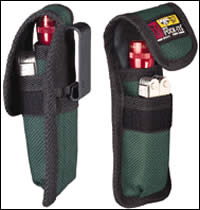 Nite-Ize Mini Pockitz is a convenient utility holster that carries a mini flashlight and multi-tool. This clip on tool carrier fits most AA and AAA barrel shaped mini flashlights, and most brands and sizes of multi tools. Made of strong, water resistant material. Color, Woodland.